No matter what time of year it is I think we all love adding a bit of glow to our makeup looks, for me it’s one step I don’t like to miss out because I feel it really just adds light to my face and just makes me feel more radiant and awake. There are a lot of brands out there with some fantastic highlighter products including The Balm and their Mary Loumanizer and Becca Cosmetics latest collaboration with Jaclyn Hill Champagne Pop, which I haven’t tried yet but it looks pretty fabulous. 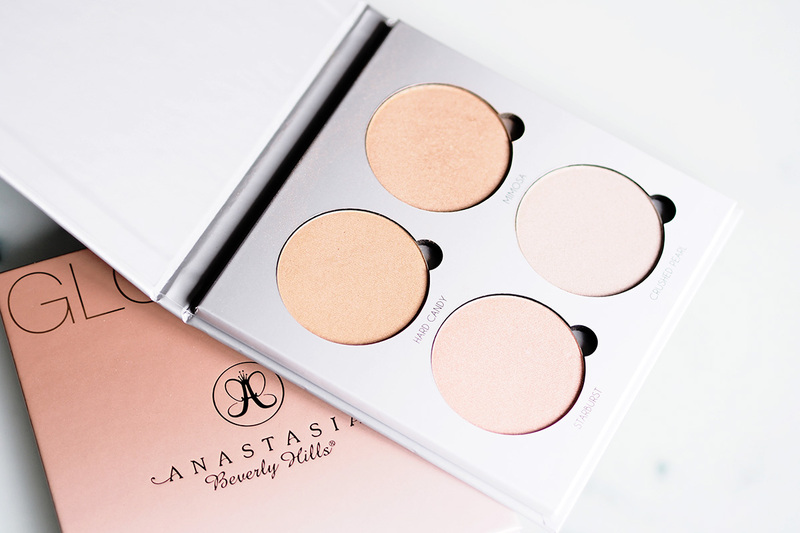 I think the key to the perfect highlighter is texture, colour and lasting power so when I found out the new Anastasia Beverly Hills Glow Kits were coming out I couldn’t wait to get my hands on them, luckily I was kindly sent the two sets to try out and I have to say I have been using them daily since I received them so I feel I’ve used them enough to give you my full thoughts on them. Each kit contains four highlighters which are described as metallic powder highlighters for intense luminosity, Gleam palette has more pink cooler toned shades and That Glow is all about the warm bronze and gold highlighters so there is a kit for most skin tones here although what I will say is that some of these shades even on days I don’t wear any self tan are a little too pigmented with colour so they show up a little more like a blush rather than an iridescent kind of glow. I don’t really mind this however because I like to mesh them all together and layer the colours using the lightest shades on the highest points of my cheek bones then the darker colours on the apples of my cheeks for a full intense highlight and glow. The kits are multi purpose so you could use these on the eyes and body also, plus you get a lot of product per pan which is really great so the $40 price tag isn’t so bad after all. Having tried the Anastasia Beverly Hills Illuminators as well as these new Glow Kits I have to say the Illuminators are more intense, the Glow Kits are perfect for a subtle glow but the shades can be intensified if you dampen the brush before you apply like I did to achieve the look in the first image (I used the shades Dripping in gold and Sunburst). The powders are finely milled and soft to touch, you can use a small fan brush to apply or for more of an intense application I’d recommend a fluffy eyeshadow brush to really focus on those cheekbones. Overall I’d say these kits are a great buy however some girls out there with fairer skin tones that want to purchase the That Glow kit may struggle to get the ‘highlight’ effect with some of the shades as they may be a little dark although you could use the shades as bronzers/blushers should you wish. 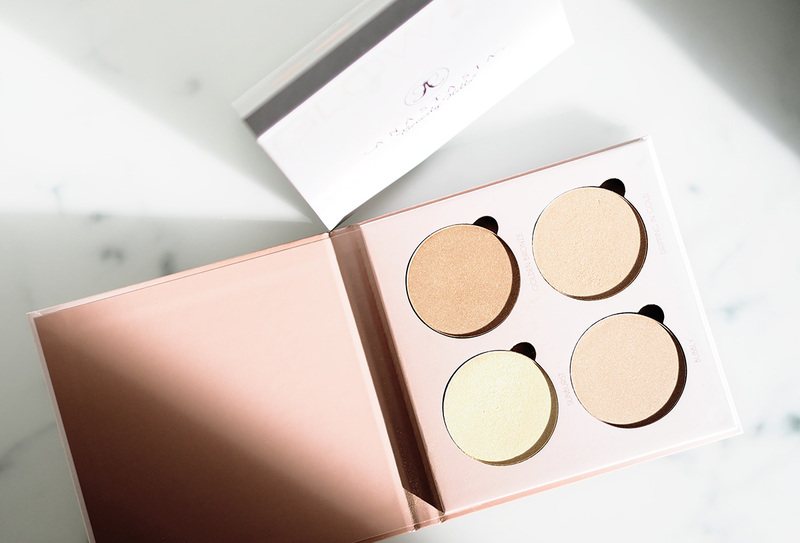 Other than that a fab little kit and I’ve definitely been noticing a full glow all day long, the longevity of these products is great they last all day long and they are multi purpose so if you are in the UK and need to get your hands on one then checkout the ABH website as they do ship to the UK or if you are patient enough then keep an eye out on the Cult Beauty website as I imagine it will be coming very soon. 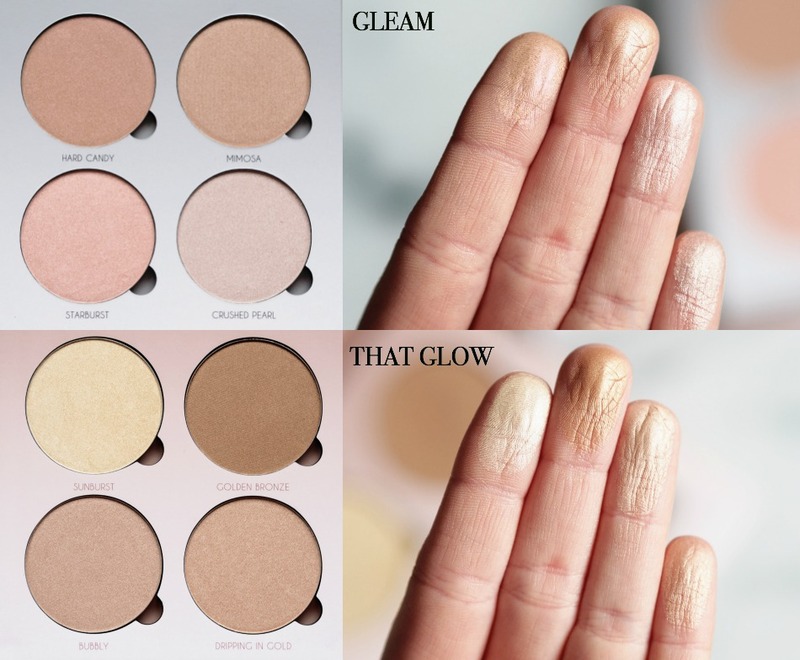 Are these something you’ve got your eye on, which kit would work best for you Gleam or That Glow?